trees but is approximately twice as long. 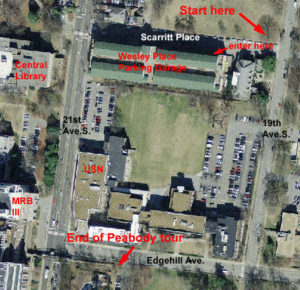 The Peabody tour meanders through Magnolia Lawn, promenades down the Esplanade, then winds its way along 21st Ave.S. back to Magnolia Lawn. It includes 37 trees. The tour is designed to make use of portable devices. An iPad is optimal, although smart phones should also work well. Each tree has its own web page and is connected to the previous and next tree by buttons at the top of the page. In addition to the text description of the tree’s location, there is a map at the bottom of the page showing where the tree is located relative to landmarks on the campus. Parking on the Vanderbilt Campus can be challenging because there are few designated visitor spaces. The Visitor Parking page contains information about possible places to park, but for this tour it is recommended that you park in the Wesley Place parking garage because it is near the start of the tour and contains many pay-by-the-hour parking spaces that can be utilized by visitors. There is free parking on the north side of Scarritt Place opposite the garage, but it is for a limited time and is usually filled by mid-morning on weekdays. Do not park in reserved or zone parking without a permit. You will be ticketed and possibly towed. 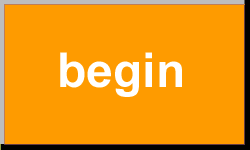 at the beginning, click on the “Begin” button above. start the Main Campus tree tour, which begins at that point. A second option for starting the tour is by picking a tree from the list below. The tree’s page has a map showing its location. Please sent your comments about the tour to Steve Baskauf.